I was fortunate enough to be the recipient of a set of the Ram Sport quad headlights before they became available to the public. I was one of the first to convert a Second Generation Turbo Diesel when I installed them on 2Timer. I wrote about the installation back in Turbo Diesel Register Issue 25, page 50, and it remains one of my favorite upgrades today. With help from Joel Toy at Innova Design and Distributing, Inc., manufacturer of the Brite Box, this conversion will permit the use of all four bulbs when switched in the high beam position. The light produced by all four bulbs makes a significant improvement for nighttime driving. Today, it is easier and more cost effective than ever to do the conversion. 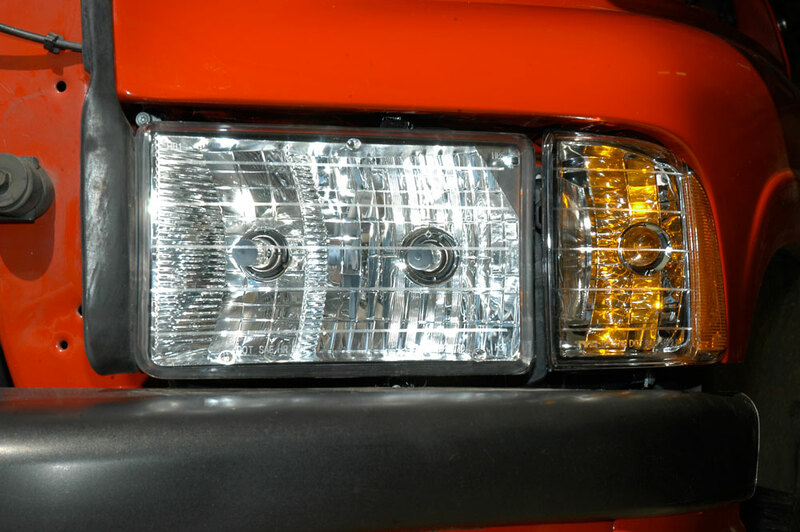 You can get the headlights and Brite Box required for the installation from us at Geno’s Garage. The Brite Box is available in several different configurations, so I did a couple of installations with the help of my friend Piers Harry. One installation was just to convert the OEM lights to the Sport Ram Quad light with the Brite Box feature and the other made the same conversion but also included the factory fog lights (so high, low and fog are all on at the same time) and daytime running lights. The installation can be a straight drop in or may require a little sheet metal trimming, depending on the build date of your Turbo Diesel. My ’98 truck was a late build, so the factory cutout for the quad lights had already been incorporated. For Piers, his ’97 was the same as my previous ’98, 2Timer, and required the sheet metal trim. If your Turbo Diesel looks like this you will not need to trim. The light pocket in my ’98 Ram Turbo Diesel already has the cut out needed to install the Sport headlights. The reason for the larger cutout is to accommodate the dual lamp sockets found on the quad light. If you need to trim, a Sawzall with a metal blade will do the trick, just be careful not to cut the ground lug found at the top of the existing headlight opening, and remember to paint the freshly cut metal to prevent future rust. Here is the Canadian Turbo Diesel with the sheet metal trim completed. Our Canadian Turbo Diesel was not so fortunate and needed to have the cut out made to accommodate the Sport lamps. A Sawzall works well. Be careful not to cut out the ground lug. Be sure to paint the cut edge to prevent rust. 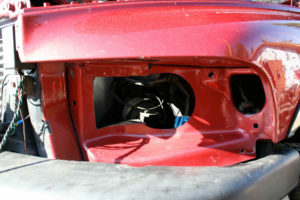 • Using a panel popper, start by removing the plastic rivets holding the rubber gasket facing the hood opening. • This will allow removal of the turn signal assembly (it slides forward) and provide access to one of the headlamp anchoring screws. Then remove the three screws, which hold the headlamp in place. One of three headlight assembly mounting screws. 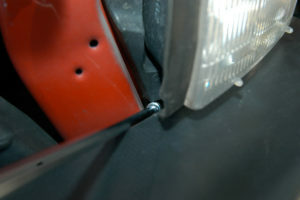 The headlamp can be removed without lowering the bumper. However, there needs to be at least a 1” gap from the top of the bumper cover to the bottom of the headlight. My experience is this spacing varies from truck to truck. If you have the required space, place a towel down on top of the bumper cover just below the headlamp assembly. Maneuver the light away from the grill and rotate it face down on the bumper, remembering to unplug the bulb. I like to call this the “contortion maneuver.” If you are not comfortable with this procedure, lower the bumper and save yourself the heartache of potentially scratching your headlamps and bumper cover. 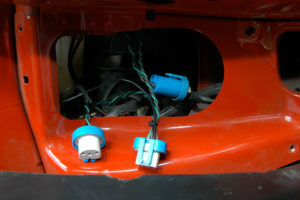 After you have trimmed and painted the sheet metal, you may plug in the adapter harness for the quad lamps. The Brite Box adapter harness installed. 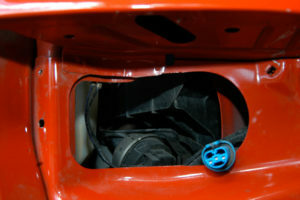 The Brite Box can be installed on either the driver or passenger side. Using the double stick tape provided, I placed the box under the hood in the battery box with the wires pointed down to facilitate drainage. For the Canadian Turbo Diesel, the radiator support was used. Once the Brite Box is anchored in place, route wiring to ground and to positive battery as indicated in the instructions. If your kit includes the additional wire to the factory fog lights, connect it now. 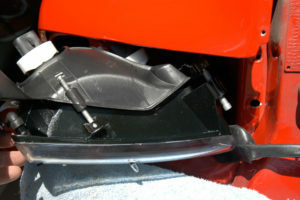 The new quad lamp assembly installs using the reverse procedure to the removal of the old assembly; towel in place, lens facing down on top of the bumper cover and rotate in place. There will be enough space to connect the lamps to the harness once they are sitting in the well before you install the three screws to hold the assembly in place. Cover the bumper with a clean shop towel, place the new Sport lamp face down, then rotate the lamp up and back into position. Installed, they not only look cool, but the lighting is far superior to the original configuration. Don’t forget; adjust the quad lamps for proper placement on the road. There is nothing worse than blinding an oncoming driver with improperly adjusted lamps. Originally published in Turbo Diesel Register, Issue 77.